The Faculty of Medicine fundraising team has seen change and success since its inception but our mission remains the same, to raise as much philanthropic funding for Medicine as possible. 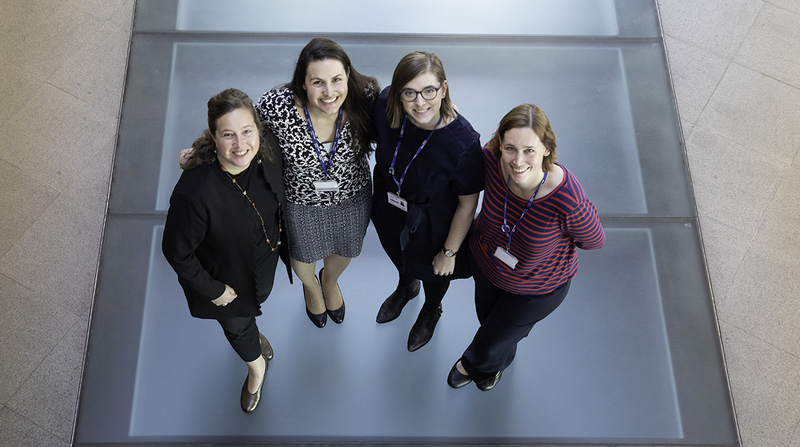 We have recently grown to a team of four: Angela Bowen (Director of Development), Amy Propsting (Head of Development), Emily Pratt (Development Officer) and Ellen Becker (Executive Assistant to the Director of Development). As time has gone on, it has become clear that the more people we have going out and speaking to alumni and friends of the College, the more donations we have secured and our totals have increased year upon year. The Head of Development role, which Amy Propsting has recently been promoted to is critical to the continuation of that success because, despite our work being governed by personal relationships, we must be strategic in our thinking in order to hit our ambitious target of £22 million this year. Historically, our work has been fairly reactive. Opportunities arise from clinicians, grateful patients, alumni and friends of the College, therefore, streamlining our processes will be key to ensuring we can be proactive in our work. Our growth has taken place alongside the wider Advancement division, who we work collaboratively to ensure that we provide the best experience for alumni and friends of the College and to ensure that we can make the most of what our alumni community has to offer. We also rely on our colleagues within the Faculty of Medicine who help us to forge connections with donors and provide potential donors with information about research and projects, which we are incredibly grateful for. At a basic level our jobs are about relationship building; building trust, inspiring interest and making it straightforward and simple to donate as possible for those who are interested in doing so. The first step is identifying people who may be interested in what the Faculty of Medicine does, helping them to understand the Faculty’s priorities and inspiring them to want to learn more about our work. This process can take years or months as deciding to donate can be deeply personal, so there really is no telling. One donor for whom this is truer than most is Marit Mohn. Just a few months ago she made the decision to give the second largest gift in our history of fundraising – donating £25 million to pioneer the Children’s Health and Wellbeing section of the School for Public Health campaign. An alumna herself, what she saw here inspired her and we helped her to understand the impact she could have. Her commitment and trust in the Faculty is incredible and we are so grateful that we have the right projects and research that can inspire donors like Marit. Our doors are always open for conversations about interactions with alumni or friends of the College who identify with what we do and want to make a difference to our work. I have worked in professional fundraising for 23 years, both in the UK and the USA in a variety of Director roles in higher education as well as the charity industry including Cass Business School, The University of Chicago, The Royal Society and The Children’s Society. I have been at Imperial College for six years. In my current role, I am a member of the Advancement Senior Management Team at Imperial and oversee the Faculty of Medicine Development programme which generates £20M+ per annum, mostly principal gifts and many from grateful patients. I consistently use my experience of running major gifts teams as well as the experience of securing gifts and stewarding UK and international donors at the £1m+ level. I have worked in professional fundraising for the last nine years, specialising in major gifts and gaining experience at some of the UK’s best-loved charities and institutions including the Tate, Kew Gardens and The Prince’s Trust. I joined the Faculty of Medicine fundraising team at Imperial three years ago and have recently moved into my new role as Head of Development. Alongside reaching out to and having conversations with friends of the College about philanthropy I am responsible for the day-to-day running of the team. There’s a lot of work to do around making sure we are as efficient we can be so that we can process gifts as quickly as possible, which keeps both us and donors happy. I am the newest team member and as the Development Officer my current priorities are Undergraduate Medicine and speaking to alumni about the priorities of the Faculty. This is challenging because many of the alumni that I speak to graduates from our affiliated hospitals before they merged with Imperial, but this presents an opportunity to educate people about the benefit of multi-disciplinary teaching within the hospitals and the research which is done here at South Kensington. I’m looking forward to speaking to alumni and spreading the word about what a special place Imperial is to inspire people to donate. I joined as the executive assistant to Angela Bowen in June of this year. I trained in hotels in Germany before coming to London to work for Four Seasons Hotel. I then moved to corporate reception with a variety of clients, before working for nearly five years as team PA and administrator to the Real Estates Director within a financial institution in Canary Wharf. This was followed by a stint as PA to the CEO of a specialised computing company before joining Imperial. My main focus is supporting Angela, freeing up her time to realise her goals for Imperial as well as supporting the entire team with general administration, document control and Raiser’s Edge database entries.